Pamukkale is one of the most famous tourist attraction in Turkey. 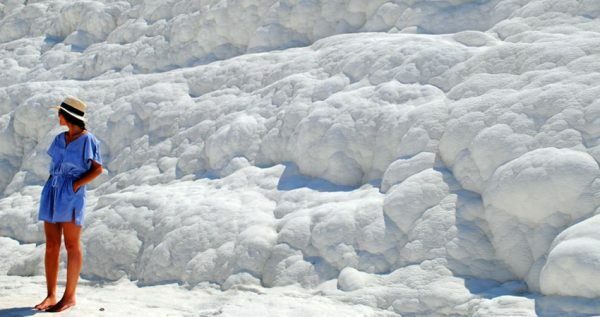 Icmeler Pamukkale Tour is a great day out for everyone to visit this unique natural phenomenon with its magnificent white terraces. 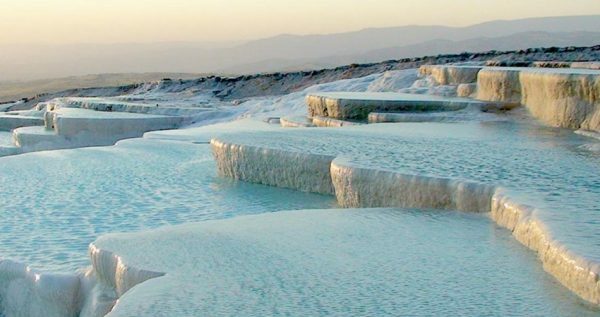 Pamukkale is also well known for its rejuvenating thermal springs and waters. The bus journey from Icmeler to Pamukkale is 210km. During this drive you will get a chance to enjoy the lovely scenery along the way. Your journey will last around three hours but once you see it you will forget all about the lenghty trip you took. As you touch the ground of Pamukkale you will have the fantastic opportunity to enjoy the breathtaking beauty of the gorgeous turquois mineral waters running around you. 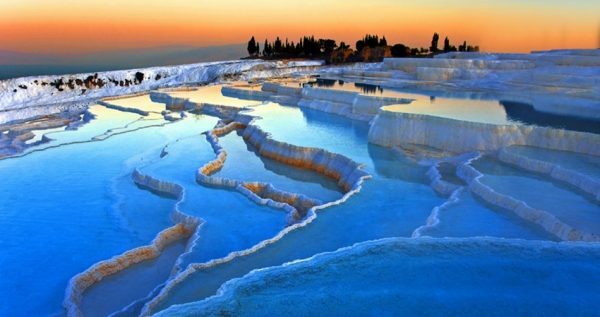 Pamukkale is not accidently called “a natural wonder”. It truly is a wonder of nature and it is waiting for you to visit it. Price of our tour includes sightseeing, entrance tickets to Pamukkale, experienced tour guide who speaks English language, and even two delicious meals, breakfast and luch. Local people call Pamukkale “The Cotton Castle“, because of its whiteness that gives it a unique soft and magical look. Another very important information is that Pamukkale is listed by the UNESCO as a World Heritage Site. Every tour to Pamukkale usually lasts around three hours. At the begining proffesional tour guide will give you all nessesary information about the site itself and after that you will have some free time to explore this miraculous site on your own. 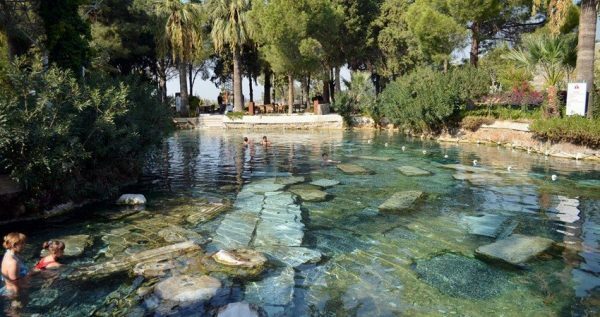 You can take a walk among the gorgeous travertines, calcified waterfalls and gorgeous thermal springs. 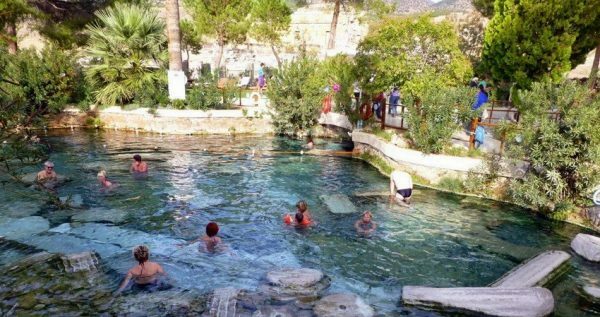 You will can also take a dip in the lovely 36 degree celcius emmerald water in the astonishing Antique pool, and in famous Cleopatra’s pool too. 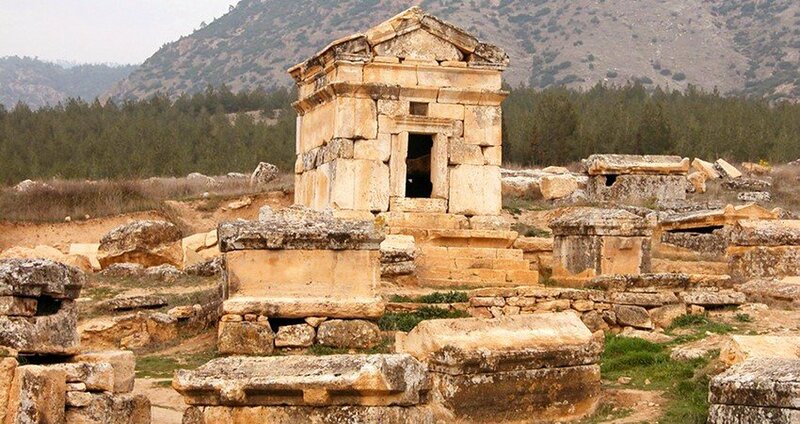 You can also choose to take a stroll through the magnificent ruins of the captivating Hierapolis ancient city, and see the necropolis, the amphitheatre, the tomb of St. Philip and more. 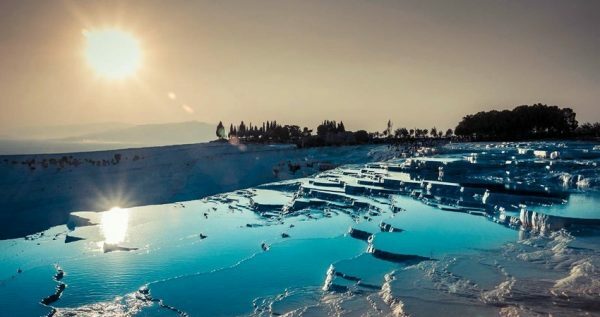 Some of the most popular poets of all times used to call Pamukkale as the passage where nature truly meets history“, and that is the greatest truth. 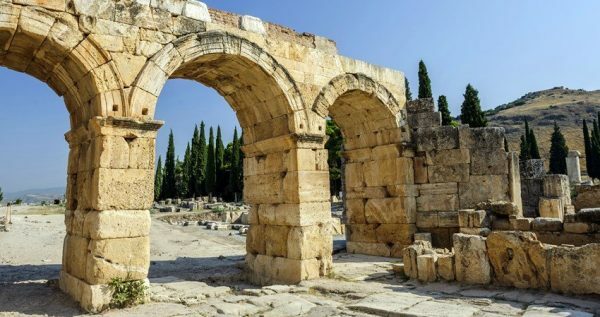 Once you visit this astoundingly beautiful place, you get the insight in the foundations on which one of the greatest civilisations in human history. 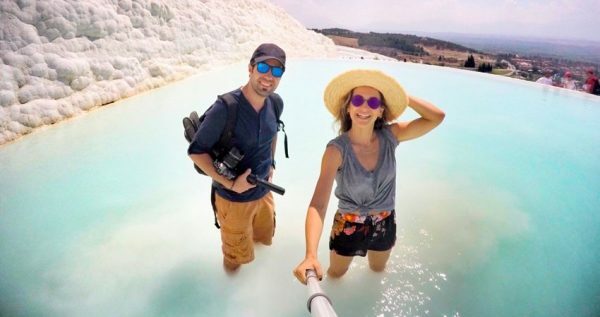 Reserve your Icmeler Pamukkale Tour tickets with us and don’t miss the chance to visit this miraculous and unique place. 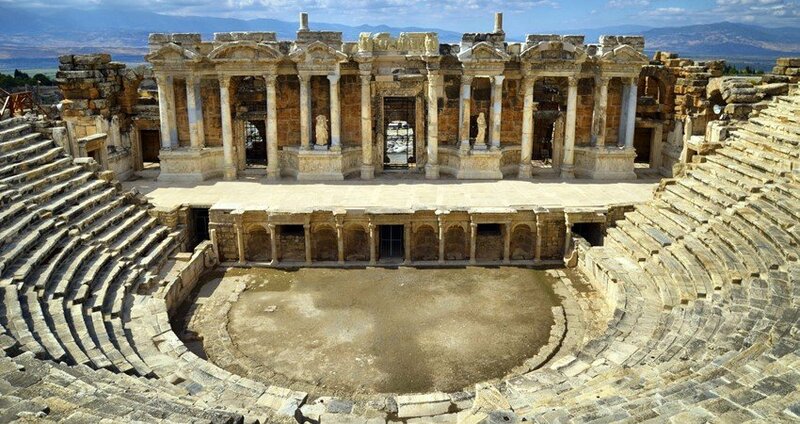 For Icmeler Pamukkale Tour we are picking you up at 06:00 and take our first break in the province city of Mugla. There we will have a delicious breakfast in a charming local restaurant. Breakfast also includes a complementary tea or coffee. This lovely meal comes free of extra charge as it is already included in the tour price. Travel in our cozy busses equipped with air-condition systems and comfy and safe seats. We make this drive to Pamukkale as relaxing as posible, so we will be having one 30- minute break in Denizli, where you will get to use the restrooms and freshen up, before we continue with our trip. Our visit to Pamukkale will last for three hours. You will get to take an enlightening walk through the ancient city of Hierapolis and hear some exciting tales about its glorious history. 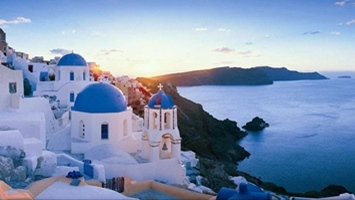 Our English-speaking guides will tell you all you need to know about this captivating site and its history and legends. You will also get to visit the gorgeous white travertines, a unique natural phenomenon formed by calcified waterfalls. They look like they have been magically frozen or turned into salt like in the ancient legends. You can also take a refreshing swim in the amazing thermal pools, one of which is the famous Cleopatra’s pool. Once our visit to Pamukkale ends, we will have a tasty open buffet lunch in a fancy local restaurant. Lunch starts with a cold appetizer, followed by a main course, and in the end some tasty sweets and some fresh fruit. We expect to arrive to Icmeler at about 19.00 in the afternoon, tehn we will drop you back to your hotel in Icmeler. We should also note that transfers from your hotel and back, are also included in the price. 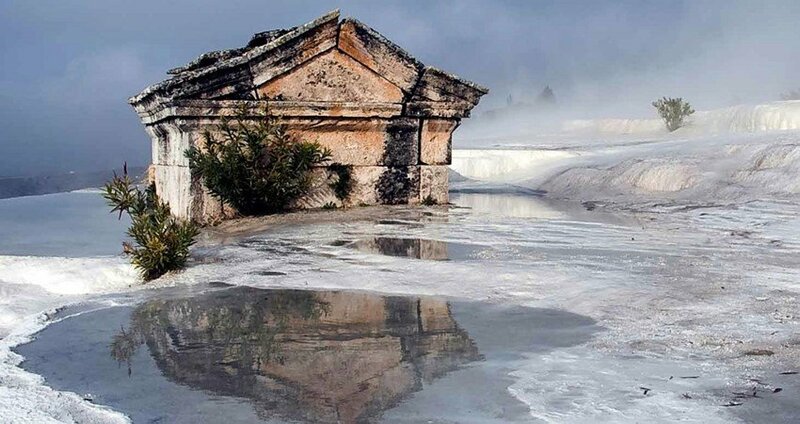 If you would like to visit Pamukkale early morning, you should check our Ephesus Pamukkale Overnight package.